Are you itching to get behind the wheel of a reliable, durable, high-quality SUV? Look no further than an INFINITI. As you would expect, this car manufacturer produces an amazing SUV that could fit the needs of just about anyone. When it’s time to drive something new in Laplace, LA, you should start looking for INFINITI QX80 pricing. Not only can you find good offers, but the pricing will open the door to some terrific features and elements that you’ve been looking for in a vehicle. When you choose the right INFINITI QX80 pricing, you will enjoy some great benefits this vehicle provides. It’s perfect for everyday driving as well as for long trips and adventurous excursions. It has a gas engine and seats seven passengers. The QX80 comes in rear-wheel drive and four-wheel drive options. It also has a seven-speed shiftable automatic transmission and a four-year/60,000-mile warranty. You won’t mind many SUVs that come up short when it comes to engines, but the QX80 is on a whole other level. Getting around Laplace, LA, won’t be a problem, no matter how difficult the terrain is or how much weight you’re pulling or carrying. It has a 5.6-liter, 32-valve, V8, DOHC engine with variable valve timing and a turning circle of 41.6 feet. The engine pumps out an eye-popping 413 foot-pounds of torque at 4,000 rpm and 400 horsepower at 5,800 rpm. You’ve got places to go, people to see, and things to carry. You’ll put your SUV to good use, and will provide ample space for you, your passengers, and all your gear. When you take advantage of INFINITI QX80 pricing, you’ll have an SUV with 95.1 cubic feet of maximum cargo capacity and a cargo capacity of 16.6 cubic feet when all the seats are in place. The EPA interior volume is 167.9 cubic feet. You can tow up to 8,500 pounds, and the maximum payload is more than 1,600 pounds. There’s a lot to like about this SUV. It will help you have pleasant rides in and around Laplace, LA, thanks to its three-zone climate control and interior air filtration. It has a tilt and telescopic steering wheel, where you’ll find the audio and cruise controls. It also comes with a front, side and rearview camera. When you want a good selection on INFINITI QX80 pricing, don’t waste your time searching all over Laplace, LA. 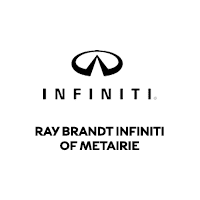 Come to Ray Brandt INFINITI today.